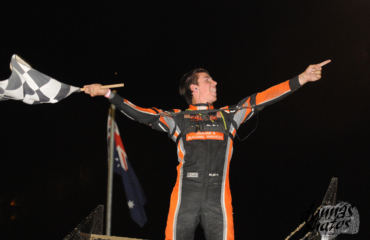 What a night it was at Heytesbury Stockfeeds Simpson Speedway on Saturday night with a stellar field turning out to compete in the richest 360 Sprintcar event in the country. 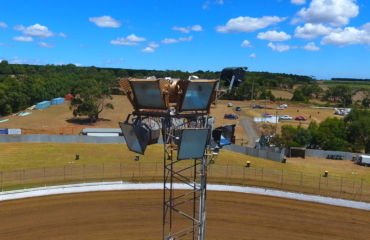 Oval Express Magazine Time Trials got underway shortly after 5:30pm with the Frijtek, BF Car Carrier’s V34 entry of Brenten Farrer setting QuickTime with a 13.472 lap over Brayden Parr, Brett Milburn, Mark Caruso & Mathew Reed who made up the top five in qualifying. 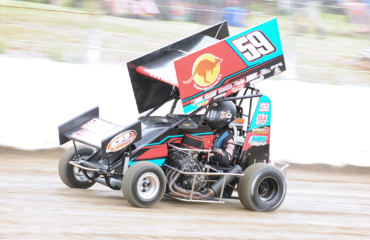 First Round qualifying heat races were taken out by Mark Caruso, Brayden Parr and Brett Milburn with thanks to Mortimer Petroleum, GKR Transport and Bar Up Bull bars for their support of the Allstars Challenge. 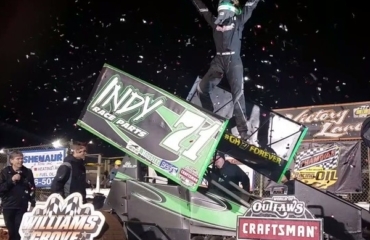 The night stepped up a notch with the second round of heat races with the American entries Gio Scelzi & Tim Kaeding dominating their respective heat races and Chris Solomon taking the final Heat win of the 2019 Allstar Challenge in fine style. Second round heat races presented by & with thanks to Hoosier, MD Motorsport and Central Vic Earthworks. When the time came for the last chance B Main local driver Phil Lock was the first to take his place in the feature event with a fine front running display. Phil put himself in the main event with Jordyn Charge, Chris Solomon, James Wren, Paul Solomon & Michael Tancredi all transferring. 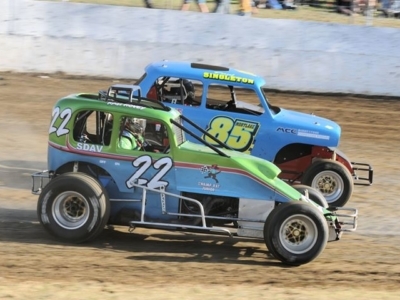 Tancredi who recovered some lost ground after failing to finish heat two with an incident in turn four locked himself in with the final transfer spot. At this point things went to a level I cannot remember experiencing at the Bungador Bullring when we entered into the pole shuffle where the SA 14 of Brendan Quinn taking honours in the first dual over a stout Brayden Parr enter the V 34 of Brenten Farrer who consolidated his original qualifying position taking the second shootout. Brett Milburn piloting the V 29 disposed of Brenten Farrer in the third shootout enter Tim Kaeding who masterfully took out shootout four. At this point it is where Tim Kaeding whom didn’t get the best start being jumped by the SA 33 of Mark Caruso when the packed crowd almost must have conceded as I did the result Tim Kaeding in a moment of pure genius or beautiful reckless abandon through the USA 91 into the tight top turn aggressive and what seemed to be a little early only to drift up in front of Caruso off turn four and drive away masterfully it drew the awe of the large crowd assembled and somewhat of a standing ovation ensued as some were left in disbelief that such a move could pay off. 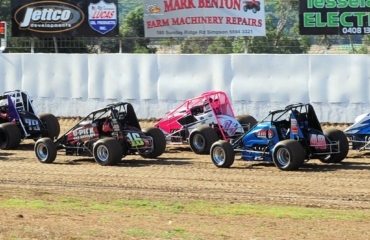 The main event was dominated mainly by the American drivers whom put on a clinic for the best part of the 35 lap feature event. Gio Scelzi lived up to every bit of the pre event hype an absolute excitement machine is the teenager from Fresno California after a modest qualifying session had the young driver down in 26. It didn’t take long to watch Scelzi sizzle through his heat races with a win and a third which placed him out of nine for the feature event. The event was dominated by Tim Kaeding from the outset watching him through lapped traffic provided plenty of excitement as he dashed and slid his way through it didn’t take Scelzi long to get to second position with a few race stoppages along the way and some masterful passing in traffic. 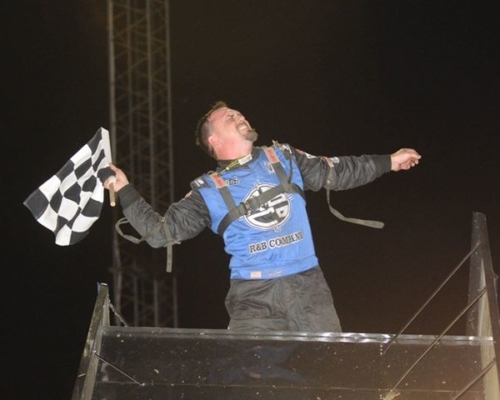 Scott Bogucki whom has spent 9 months over the last three years in the USA working with American Sprintcar driver Johnny Herrera touring the ASCS National 360 Sprintcar Series whom also showed plenty of the skill and craft he has learnt from his experience in America crossed the line in third however was later promoted to second after the disqualification of Scelzi. It was a disappointing end for Scelzi who was disqualified due to a scale infringement where the USA hotshot returned to his pit enclosure without going across the infield scales on his way off a disappointing end however showed his absolute class by putting on a smile & signing autographs for the adoring race fans. 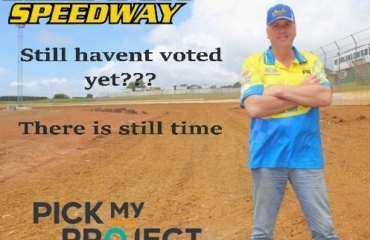 The top five was filled by Brendan Quinn, Brenten Farrer and local legend John Vogels whom all battled on gamefully however had no real answers for Kaeding or Bogucki. The Super Rods and SDAV Hotrods put on a fantastic display of rumbling V8 action with heat race wins going to the SDAV 3 driven by Allan Pitcher taking the opening heat race of round one joined by the W55 of Michael Coad & the W8 of Jamie May. Round two heat race wins belonged to the S13 of Shaun Walsh the W55 of Michael Coad & the evergreen Ewan Mckenzie piloting the W98. We then rolled into The Top Rod challenge where the top three Super Rods and the top three SDAV hotrods were pitted against each other in a timed event which was claimed by the SDAV 84 of Shannon Meakins with a best lap time of 16.974. 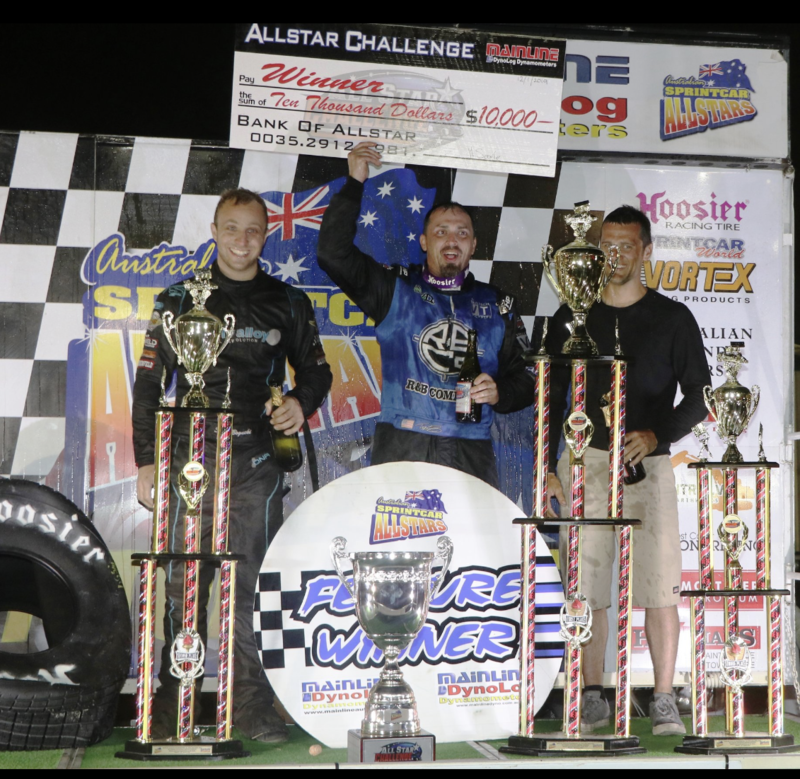 The Southern Rod Showdown feature event was a real battle of attrition with only ten of our twenty strong field finishing on track. Allan Pitcher looked comfortable out in front a period in the feature decider with Shaun Walsh following him everywhere without being able to apply any real pressure in the early stages Pitcher was strong from the restarts up until he succumbed to what appeared to be suspension failure at around the 9 lap mark leaving Shaun Walsh to go on and win in fine style from Micahel Coad & Ewan Mckenzie with Neville Gange and Shannon Meakins filling the top five. A big thank you to Vogels Motors whom were our presenting partner for the January 12th event.